Map showing the location of Odi Stadium in South Africa. 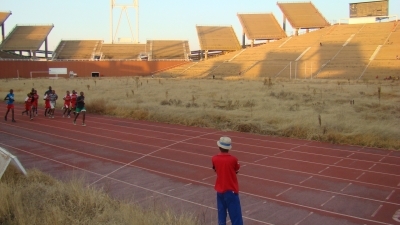 the anc government abandoned both Odi and Mmabatho stadias, with the intention to erase Former Bophuthatswana legacy. same thing with industrial sites, and Teachers colleges. As a football fan,I remember Odi Stadium for many classic games. The stadium should have benefited from the Fifa 2010 World Cup Legacy program. A bit of an upgrade on power and water line,will do just fine. Yoh is this what it has come to? I live just next to it and I didn't even know that this was the case, how am i going to allow my child to go into such a scary structure for training? Who can be connected to put this magnificent structure of ours back into its original form? Come on guys lets try to do something with this stadium.i believe that it's the biggest stadium in tshwane.look at old trafford in manchester it was used for war in england but know,it's one of the world's greatest stadium. Odi stadium is without water, electricity and no maintenace. This stadium need to function like before, it a man made structure if there is anything wrong with the physical stucture surly it can be fixed, the community can benefit a lot from this stadium. PLS COMMENT ON THIS ISSUE. Is it going to be used in the South Africa 2010 World Cup? You have the ability to request en edit to any of the details of Odi Stadium. You can do this by clicking on one of the options below.